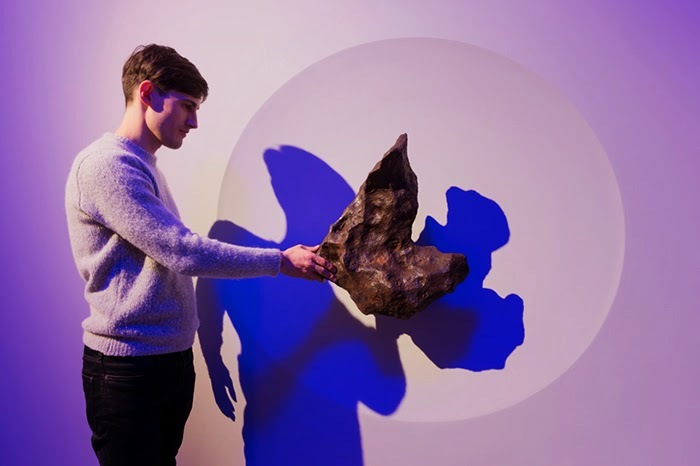 The show has a cave-like entrance showing the fragment of meteorite as an enigmatic messenger from space. Beyond this small room are dark passages leading to one cavernous space after another. 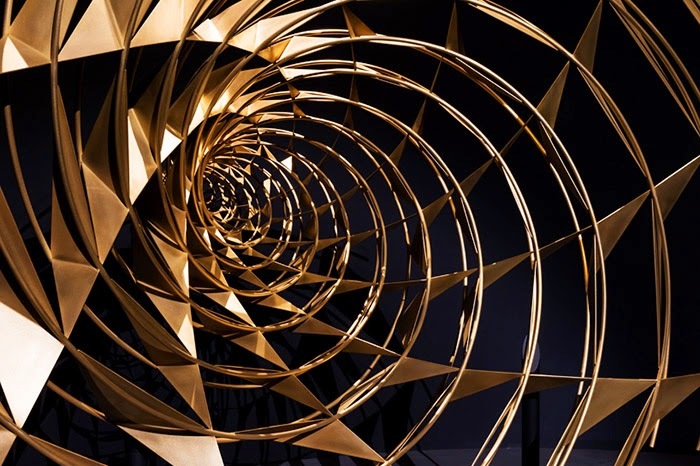 “The route through the exhibition is derived from the geometry of the circle and founded upon the underlying principle of circularity,” says chief curator and artistic director of the foundation Suzanne Page. The exhibition feeds the senses and explores ‘the relations between self, space, and universe’ by creating a surreal, alternate reality within the newly-built museum. 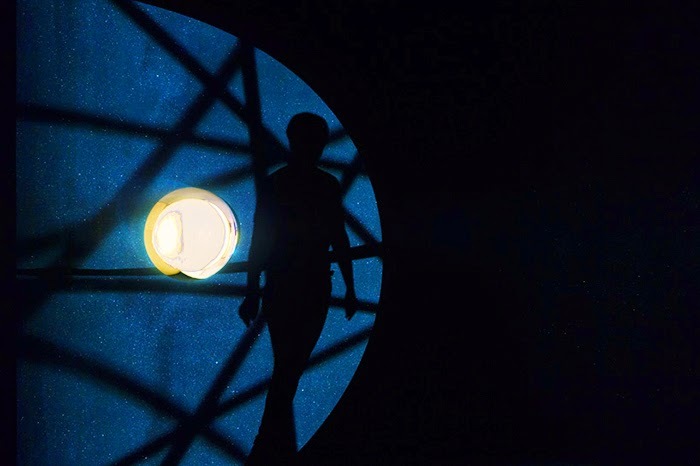 The installations immerse visitors in an interplay between moving light and shadow, a chiaroscuro which seemingly transports the audience into the complete darkness of outer space. 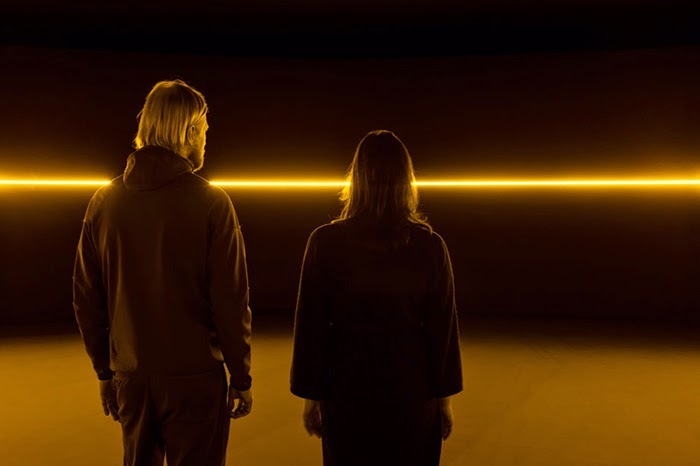 The show is part of Eliasson’s on-going study of human perception and the construction of space. 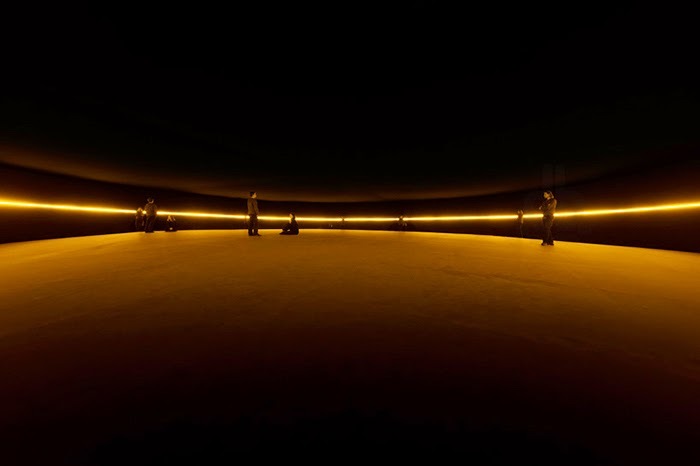 Entering the show, visitors move on the sloping floor as if walking across the top of a planet, the light passing along the circumference of the space is reminiscent of one planet passing in front of another. 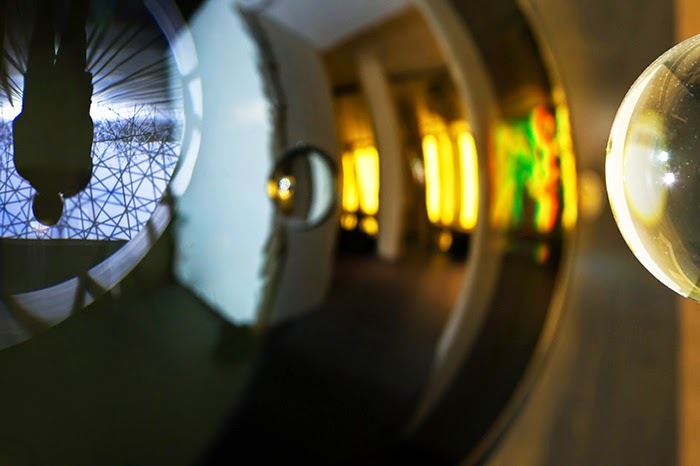 The show exhibits eight works including the rooftop heliostat 'sun tracker' that refracts rays onto a polyhedron sculpture suspended near the museum’s entry. Eliasson’s site-specific Inside the Horizon, has 43 illuminated triangular columns staggered out along the museum’s grotto. 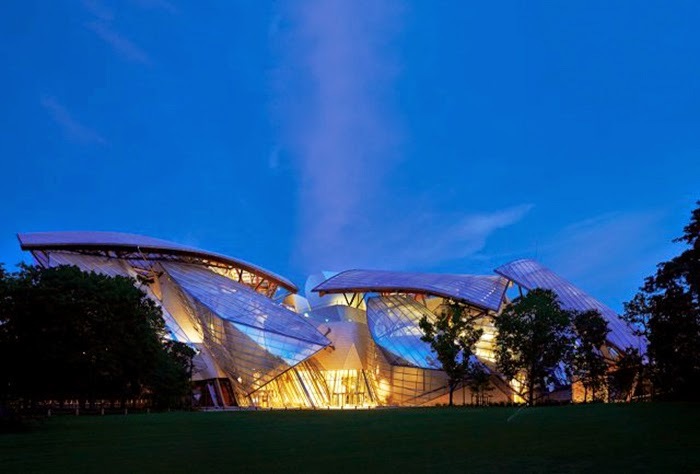 Eliasson says he and architect Frank Gehry share complementary visions: “All of my spaces are generally something you can put down to basically two or three geometrical shapes – circle, cone, triangle – unlike Frank’s building, which is all about waves and free forms and unpredictable." One of the installations, the Big Bang Fountain, is Eliasson’s water experiment capturing the split-second between upward pressure and downward gravitational force, illuminated with a strobe light so that a splash becomes a wondrous cosmic phenomenon. 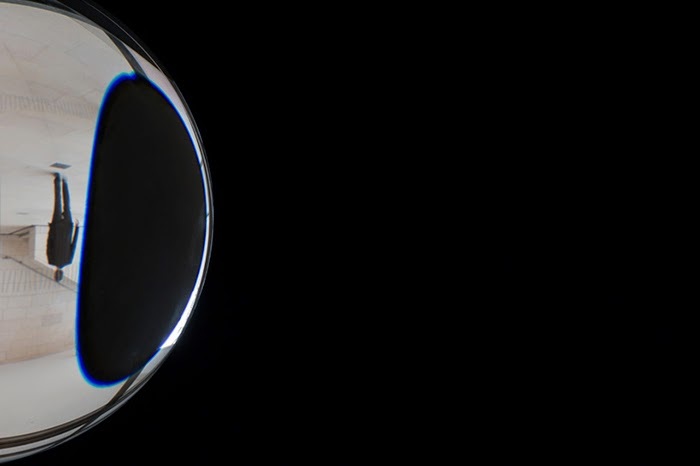 The fountain dances in a sphere of glass refracting images from the outside world, like an alchemist’s orb. Another great, cave-like gallery opens out revealing a crystalline, icy realm of white light and black shadows. The temperature in this space is noticeably cool. Overhead, a black moon-shaped shadow moves over the ceiling. Gradually you realise only half the awe-inspiring oval space is real: it is bisected by a mirror. This place exists fully only in your own mind. 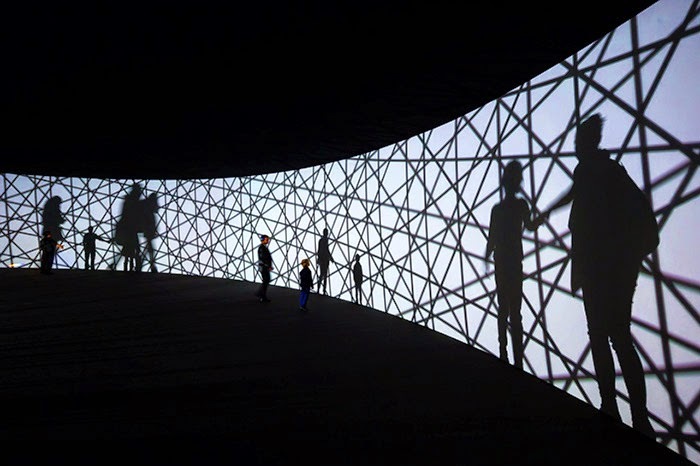 Eliasson reveals that light and space themselves are created inside the brain. His illusions are grandiose, but he lets you know they are illusions. Outside the show, two glass balls revolve mechanically as he reveals the simple truth behind what looks, from inside the grotto, like a pair of dancing eyes in a shimmering surreal ballet. Another grand chamber feels very hot and you are surrounded by a thin orange line of flame. But the last and most compelling installation is a fountain sputtering in darkness. Every few seconds it is illuminated by a seeming flash of lightning. 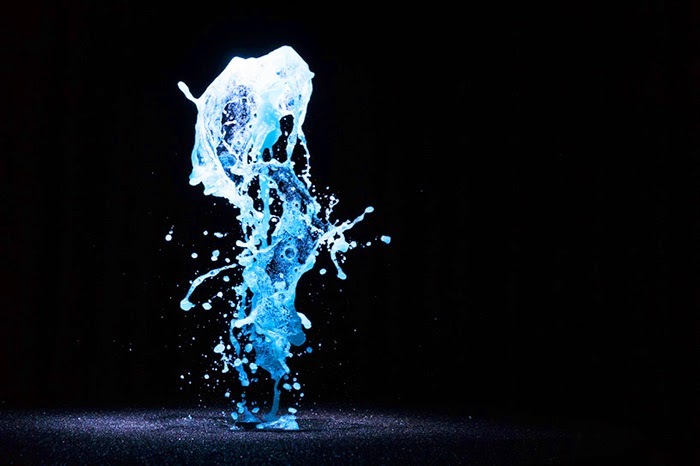 The dancing water leaves a lasting impression on the mind ~ like the rest of this magical, otherworldly exhibition.